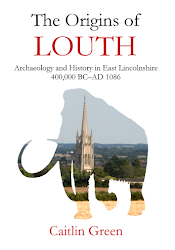 The following brief note is concerned with the small number of early medieval silver coins from India that have been found in northern Europe and Britain. 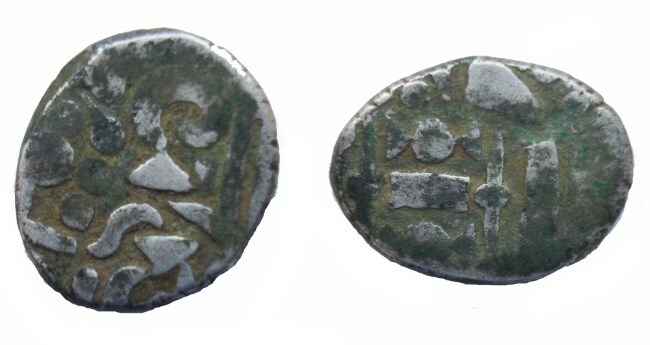 Although the numbers of these items are small, with the PAS recording only three from Britain, it can be tentatively suggested that at least some of these coins are likely to be genuine arrivals from India in the early medieval period, rather than simply modern losses by tourists. The distribution of Indian coins in northern Europe and Britain, along with the mints that produced them (drawn by C. R. Green). 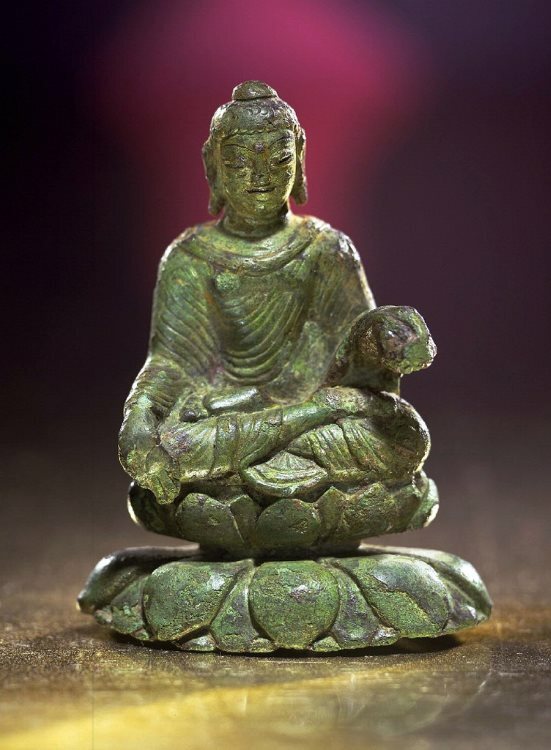 Also shown is the Helgö Buddha (found in Sweden), the locations of the mints in Afghanistan and Uzbekistan from which thousands of Islamic dirhams travelled to northern Europe, and the likely route taken by these dirhams and potentially by the Indian coins too. Indian silver coins of the early medieval period have been found in small quantities at a number of sites in Germany, Poland, Estonia, Russia and Britain. These coins have received relatively little attention, but the evidence we have suggests that the continental coins, at least, were almost certainly fellow travellers with the hundreds of thousands of Islamic silver coins or dirhams that have been found in northern Europe (probably indicative of many millions of Islamic coins originally imported into the region) and whose presence is associated with the Vikings and their trading activities, perhaps primarily the slave-trade. 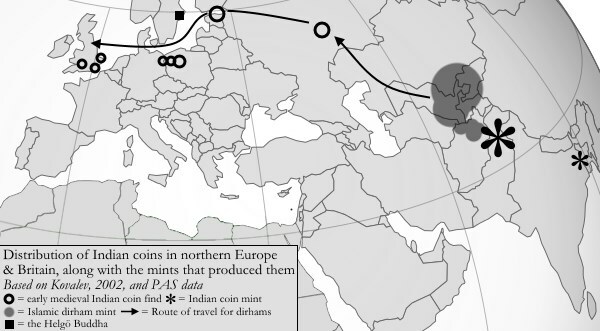 Not only are the Indian coins found in the same areas as the Islamic dirhams are located and along the likely route that the dirhams followed northwards and westwards, but the continental Indian coins shown on the map above also all actually come from hoards of Islamic dirhams, confirming that their presence in northern Europe is indeed part of the same phenomenon as the movement of dirhams into this region. Looking at the Indian coins themselves, it is worth noting in light of their association with Islamic dirhams in northern Europe that the Indian mint producing most of these coins lay immediately to the south-east of the dirham-producing mints of Uzbekistan and Afghanistan, at Ohind (Waihind, also known as Udabhandapura or Hund) in what is now northern Pakistan and was then the Indian Gandhāra kingdom, ruled by the Shahis. Furthermore, both Roman Kovalev and Thomas Noonan have noted that the hoards in which the Indian coins are found all date from the period in which dirhams were becoming increasingly rare, from the mid-tenth century onwards. 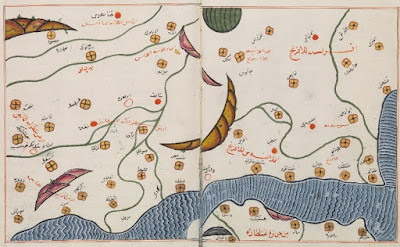 In such circumstances, they suggest that the presence of Indian silver coins in northern Europe probably represents Central Asian merchants looking further afield for new sources of silver to fund their trade with northern Europe as the Sāmānid dirham supply significantly faltered, with the result that they started to occasionally supplement their silver dirhams with Indian silver coins from the regions that lay to the south-east of the dirham mints. Needless to say, such a scenario seems a credible explanation of the presence of small quantities of early medieval Indian coins in northern Europe and their clear association with Islamic dirhams there, and the notion that early medieval trading networks between northern Europe and Central Asia could indeed sometimes extend down to the Gandhāra region of India is in any case supported by the Helgö Buddha, a sixth-century statue from this area that was found in an eighth-century context in Sweden. If the above is the case for the early medieval Indian silver coins found on the continent, what then of those recorded from Britain? 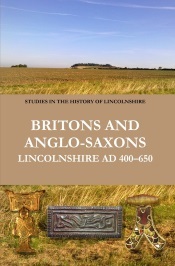 For the most part, there seems little obvious reason to divorce all of the British finds from either the general early medieval context of small numbers of Indian silver coins being found in northern Europe, or the occasional trading links between northern Europe and India (probably via intermediaries) additionally implied by the discovery of the Helgö Buddha in an eighth-century Swedish context. Certainly, Islamic dirhams are known in some numbers from Britain, as was discussed in a previous post, with the vast majority of these dirhams probably finding their way here as part of a westwards extension of the Viking bullion economy of northern Europe. As such, the presence of a few Indian coins in Britain might not be entirely unexpected, given the clear link between finds of dirhams and Indian coins on the continent. Furthermore, and perhaps most importantly, it is worth noting that two of the three Indian silver coins from Britain recorded on the PAS (the Wiltshire and the Norfolk examples) are both coins of the Gandhāra kingdom and of the 'right' period too, and so would seem to fit easily and naturally into the continental pattern, and the same is true also of another Indian silver coin recorded on the UKDFD as found in Britain, but which lacks a reliable, more specific provenance within the country. On the other hand, we do still need to exercise caution. 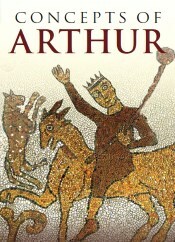 First, the three British finds of early medieval silver coins from Gandhāra recorded by the PAS and the UKDFD are single finds rather than constituents of Viking hoards, unlike the Indian coins recorded on the continent, and only one of three coins is known to come from the Danelaw area where dirham finds are concentrated (one of the others being of uncertain British provenance and the other being found in Wiltshire, outside of the Danelaw). However, it is worth remembering here that the reason why all of the continental finds analysed here come from hoards may simply be the fact that only Indian coins found in hoards were catalogued by Kovalev, the source used in creating the above map; there may well be single, non-hoarded finds of Indian coins from the continent too, but any such material has not yet been catalogued or published to my knowledge and so is not included here. Similarly, whilst only one of the coins from Gandhāra has a certain provenance in the area of Britain with the greatest concentration of dirhams, the Danelaw, one of the other two coins from Gandhāra could conceivably have come from this area due to its uncertain British provenance, and while the last was found in Wiltshire, Islamic dirhams are in fact known from this area, albeit in much smaller quantities than is the case in the Danelaw. Map of early medieval India, showing the location of various dynasties and empires. The map shows the situation in the period before and around AD 900, but should serve to show the general geographic relationships of the various dynasties. The Shahis of the Gandhāra kingdom, now in northern Pakistan, are marked in the north of the map in the position they occupied in and after c. AD 900, with the location of their capital of Ohind also indicated. 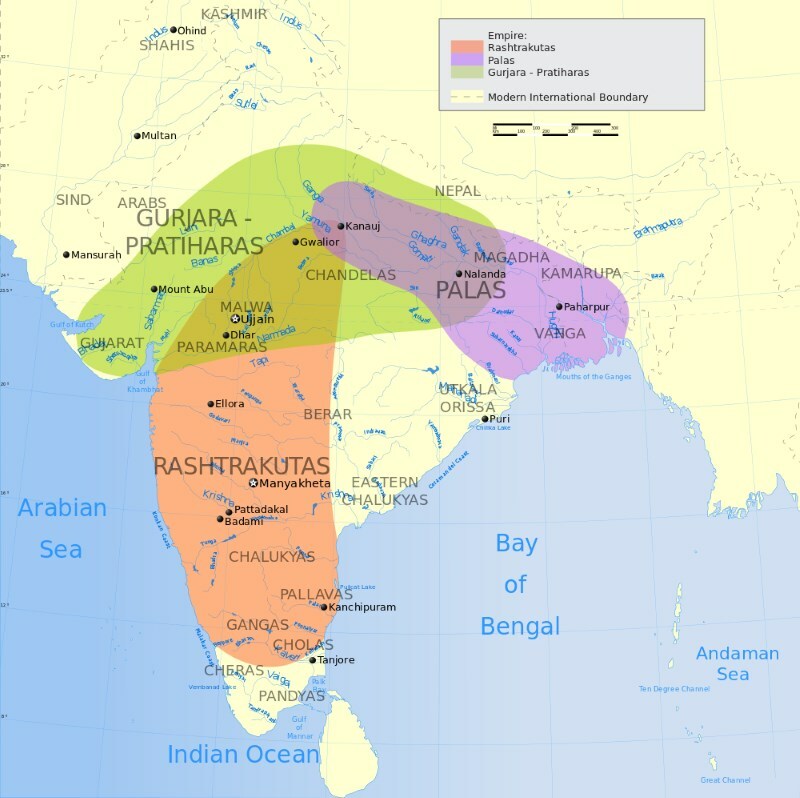 The fluctuating areas controlled by the Pratiharas dynasty of Gujarat and the Palas dynasty of Bengal in northern India are also marked (image modified slightly from a CC BY-SA 3.0 licensed map, Wikimedia Commons). Second, there are a number of early medieval Indian coins found in Britain that are not silver coins of the Gandhāra kingdom of the type and era that appear in Viking-age hoards. It need hardly be said that these finds, which seem to fall outside of the general pattern of trading observable on the continent and have been found singly rather than in hoards, need to be potentially viewed with much more scepticism than those mentioned above, as there must be a significantly greater risk that they are in Britain as a result of eighteenth- to twentieth-century 'tourist' losses. Nonetheless, it is still not impossible that some of these too arrived here via the early medieval Central Asian and Viking trading networks, and consequently details of these finds are provided below. The first of these coins was found near Chester, on the edge of the Danelaw. It is dated to the early medieval period on the PAS, and described there as an 'unidentified gold stater, possibly Indian or Afghanistan', so perhaps envisaged as being of the Gandhāra kingdom, as this encompassed significant parts of Afghanistan before the start of the tenth century? Given the uncertain identification and the fact that the coin is of gold, not silver, this find obviously needs to be treated with considerable caution. Another find is an Indian silver coin of the Palas dynasty of Bengal, dated AD 850–988, discovered by a metal-detectorist near to Hastings in East Sussex. This coin is not only found well away from the Danelaw, in an area with no known silver dirhams, but it was also issued by a dynasty from a region significantly more distant from the Central Asian trade routes than was Gandhāra. However, as can be seen from the second map included above, the Palas dynasty was not confined to modern Bengal but controlled a significant proportion of northern India at various times in this era, and the coin is of the right material and period. 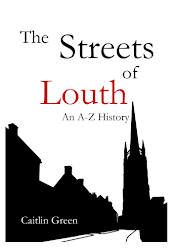 As such, it is not wholly impossible that it might have made its way to Britain as part of the trade process described above, after first being transferred to the Gandhāra kingdom as a result of trading within India. Finally, two early medieval Indian silver coins of Gujarat are recorded by the UKDFD, one from Bedford (possibly of the eleventh or twelfth century) and another from Southwell, Nottinghamshire (dated broadly to c. AD 470–800). Both are of the right material and found in the Danelaw, where most Islamic dirhams occur, and the Gujarat Pratiharas dynasty certainly ruled on occasion right up to the southern edge of Kashmir, so it is again not entirely impossible that these coins could have been transferred to the Gandhāra kingdom and then moved on north and westwards. However, we do need to be wary with these two coins, particularly as the first coin appears to post-date the silver coins of the Gandhāra kingdom that are found in northern Europe and Britain by a potentially significant amount, and the second coin appears to pre-date them to an equally notable degree. As such, they need to be treated with caution. The content of this post and page, including any original illustrations, is Copyright © Caitlin R. Green, 2014, All Rights Reserved, and should not be used without permission.